Once again proving their momentum is well-deserved with a sweltering set last night at the Turf Club, blues-punk rockers the 4onthefloor have come up with the perfect release date for their debut album: April 4, as in 4/4, same as the time signature of all of the quartet's songs. The name of the record will also be "4 x 4." 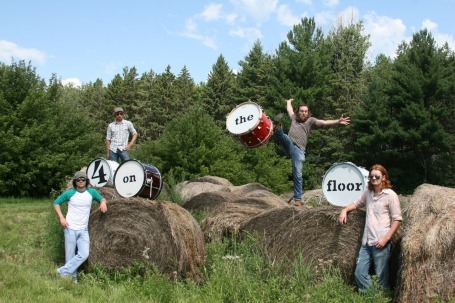 All of this, um, quadromania is also in keeping with the fact that all four of the band members perform with a kick drum at their feet -- i.e., the four on the floor. Check out their YouTube page for examples of their unique setup. It might sound a little gimmicky, but the group was quite a serious thrill onstage last night. Wooly-bearded frontman Gabriel Douglas is a deft rawwwk howler with deep, devilish undertones, sort of an unholy blend of Patterson Hood and Glenn Danzig. And the whole unit has an uncanny tightness, which may or may not come from the inherent fact that they all have to literally play in step. Among the highlights last night were the audience-participatory, hand-clapping original "First on a List of Things I Don't Need" and a rowdy cover of my personal-fave M. Ward song, "Magic Trick," both of which are featured on "4 x 4." The album will actually be available for download on iTunes next Tuesday, but the vinyl edition is out in April. Another fun thing about the 4onthefloor: Between now and the album release, they're playing a string of gigs all around Minnesota and Wisconsin in towns that most local bands don't even know exist, including not one but two shows in Dresser, Wis. (Feb. 11 at the Boulevard and Feb. 18 at Trollhaugen), plus a show tonight at Eau Claire's House of Rock and another Feb. 12 at the Sawmill Saloon in Seely, Wis. Info on all these gigs is at www.4otf.com. As Gabriel Douglas explained it, they book all these out-of-the-way shows "because one of us will know a bartender or somebody else who works at the bar." He was quick to note, though, that they will "really go on tour" after the album's release. I'd say they're already a touring band. You can also catch them in town at the next Gastro Non Grata show at the Triple Rock on Feb. 13. The Metropolitan Opera simulcasts John Adams' "Nixon in China"